I don't know that I've ever reviewed a Nicholas Sparks film on this site before. There often seems no point due to the fact that if you're seeing these movies you know exactly what you want and what you're getting and while that is probably the case here as well, there was something unquestionably intriguing about the tone set by the trailers for The Longest Ride. The musical choices that included Banks "Waiting Game," signaled something of a forbidden, almost haunting love story that might be worth tuning into due to the team behind translating the Sparks story to the screen felt uncommon. It's not out of the question given love stories depend more on the way they're told and the chemistry of the actors involved to be successful than that of the actual story and with director George Tillman Jr. (Soul Food, Notorious, Faster) there certainly seemed potential for something interesting. Love is such an intangible thing it's always difficult to capture the essence of what makes it so special without resorting to cliches and typically that is what Sparks ends up doing. The Longest Ride fortunately doesn't fall prey to the trap of some of the more recent Sparks adaptations in that it doesn't go completely bonkers in the end and makes all kinds of convoluted twists with the only significance being to shock the audience. I haven't seen Safe Haven, but heard it was quite a doozy while I actually caught The Best of Me a few weeks ago and despite the set-up hinting at nothing down the road it became fairly evident where things were heading the moment a couple instances took place one after another. With that in mind, what there is to appreciate about Ride is that it is little more than a basic human story about figuring out priorities and becoming satisfied with a routine that only has a few contrivances forced on it in order to create conflict, but none so outlandish it makes the viewer realize the ridiculousness of it all. It at least feels like an earnest attempt to portray love whereas the majority of the recent Sparks films feel more like cash-grabs capitalizing on manufactured emotions. Luke (Scott Eastwood) is immediately smitten with Sophia (Britt Robertson). We are first introduced to Sophia (Britt Robertson), a senior at Wake Forest who is really into the arts and even has an internship lined up for the summer in New York that will have her working in galleries alongside top industry folks that will inevitably lead to a prosperous career, but before all goes too well for the pretty young upstart she will be forced to go to a rodeo with her sorority sisters. Appearing to be nothing more than a carefree night on the town, Sophia looks at it as something of a reward for not letting herself have any fun the first three years of her college experience. Of course, the night she does decide to go out she meets handsome professional bull rider Luke Collins (Scott Eastwood) and things will never be the same. The two have something of an instant connection (of course, in Sparks world introductions graduate to full blown affection over the course of a first date), but they soon realize they are on two very different paths and with only a month left before Sophia leaves for New York it would be best to go no further with their relationship. As Luke drives Sophia home from their first date though they see a car on fire on the side of the road. Inside is an elderly Ira Levinson (Alan Alda who is especially strong in most of his scenes) whom Luke rescues while Sophia grabs a wicker basket full of letters from his front seat. After dropping Ira off at the emergency room Luke leaves, but Sophia decides to hang back for a little while. In doing this she begins snooping through Ira's letters which then opens up the film for a two for the price of one scenario as we see the parallel stories of Sophia and Luke and Ira and Ruth (Oona Chaplin) unfold while teaching us all a lesson or two about what it takes to truly make love work. 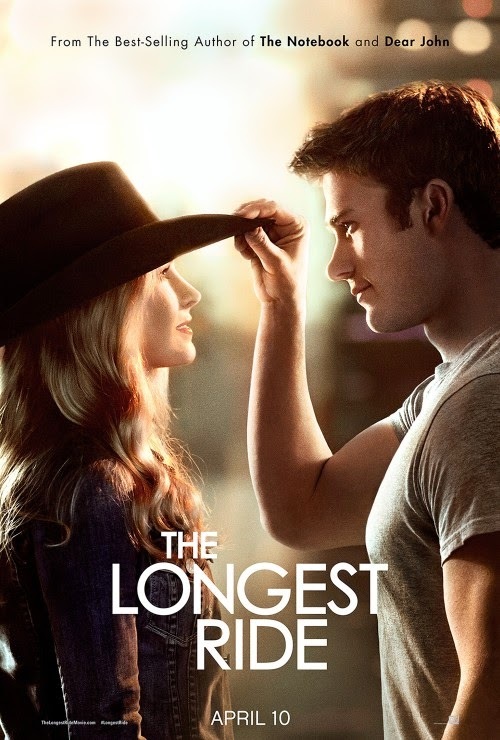 Spanning generations these two intertwining love stories help The Longest Ride deliver all you could want from a film like this if you're paying today's ticket prices to see it, but maybe even a little more since the film runs at an unnecessary two hour and ten minutes. There are, of course, many issues one could take with the film given the whole plot device of the letters that Sophia discovers and ends up reading to Ira as he can no longer read them for himself (even with his glasses) are all simply descriptions of events that both a young Ira and Ruth experienced together despite the letters supposedly being for Ruth. I mean, I'm sure it's sweet to Ruth (who also happens to love the arts) that her husband makes an attempt to capture their love by recounting it through his writing, but it would have been easier had Sparks made this a diary or even if screenwriter Craig Bolotin would have changed this detail from the book. No matter the source of the flashbacks another problem the film runs into is that hearing Ira and Ruth's story requires Sophia visit the elder Ira every time they want to return to the past and while it is somewhat necessary to establish a relationship between Ira and Sophia that is critical to the third act, it also draws out earlier portions of the film that could be tightened. Making the film feel all the more generic is the look of it. While the music and editing of the trailer made this out to be somewhat enchanting in a way most melodramatic love stories of the Sparks variety are not, the film still ends up with the same aesthetic as every other movie in the genre that makes it feel as broad as possible with no distinctive touch to separate it from the pack. I hoped with Tillman behind the camera and cinematographer David Tattersall (The Green Mile, the Star Wars prequel trilogy and a large collection of others, but no prior Sparks adaptations) that we might get something a little more in tune with the emotions at stake. Instead, it all feels more small scale while the multi-generational story covering decades of emotions should be met with something more intimate while being able to encapsulate the gravity of the cause and effect themes the story is playing with. There is a single war scene meant to signify the determination of young Ira (Jack Huston) to get back to Ruth, but it is shot in such a way it feels like the cheapest thing in the film and is unable to conjure up the necessary tension because the scale is so obvious. 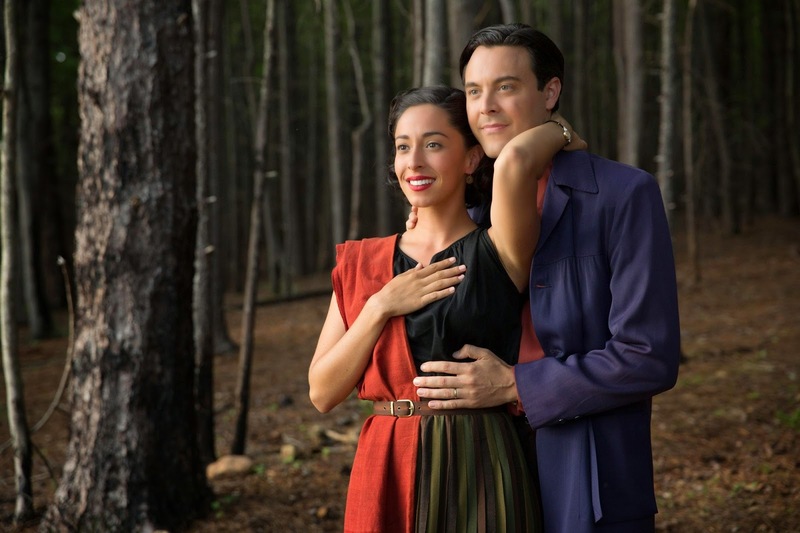 Ruth (Oona Chaplin) and Ira (Jack Huston) have a love story to rival that of Luke and Sophia's. On the plus side is the fact the performances are charming enough. While it will always be argued they are pulled down by the sappy, hokey and generally manipulative stories that Sparks spews at this point (he's seventeen books in and still working with the same archetypes) all the main players here are at least trying and come off more credible than I thought possible. I knew Robertson was rather good as her stand-out performance in Dan in Real Life at the age of seventeen is the thing I will always relate to her, but whether or not Eastwood junior could carry a leading role was yet to be seen. In short, he does what is required of him here which is largely to be the southern gentleman and take his shirt off numerous times so as to justify that aforementioned ticket money the ladies seeing this spent on good faith this is what they'd be receiving. While Robertson and Eastwood are fine enough together their love story hardly merits a film as their "conflict" could easily be resolved were they two level-headed human beings (which Sophia is, for the most part). The more interesting story is so obviously that of Ira and Ruth it hurts that this is seen by the filmmakers as the secondary tale. Rather than just questioning whether or not they will end up together (which is the sole dramatic leg Sophia and Luke's story stands on) we get some genuinely moving moments between Ira and Ruth as we clearly see how much they love one another despite the compromises they must make to be with one another. It is more the tests that life throws at them that make us question if their relationship will be able to remain strong. The chemistry between Huston and Chaplin is also all the more palpable as Oona is especially charming and exudes a charisma that is effortless and helps us understand why Ira found so much to adore about her. Had the film just been the story of Ira and Ruth it might have proved more honest, but in tying in a present story so as to display that most love requires sacrifice for the greater good makes it feel just the right amount of hackneyed so that Sparks can pack some kind of third act revelation into the narrative rather than delivering a simple yet relatable human tale.